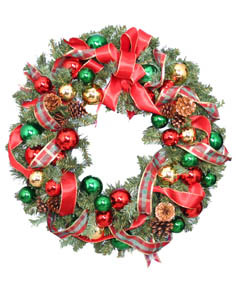 Pvc Wreath, Gold, Red & Green Millimeter Balls, Pine Cones, Wired, Red & Gold Wired Ribbon, Holiday Plaid Wired Ribbon. 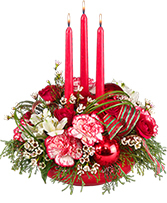 Red Round Design Bowl With Wet Floral Foam, Red Taper Candles, Foliage: Seasonal Evergreens, Bear Grass, Red Spray Roses, Peppermint Carnations, White Alstroemeria, White Waxflowers, Red Millimeter Balls, Red And Green Striped Ribbon. 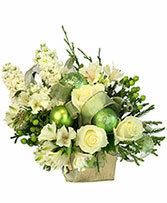 Gold Cube, Assorted Green Christmas Ornaments, Ribbon, Assorted Christmas Greens, White Roses, White Stock, White Alstroemeria, Green Hypericum. 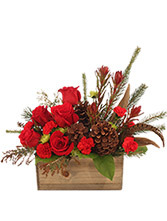 X X Rectangular Wooden Planter Box With Liner, Wet Floral Foam, Foliage: Salal, Acacia (Or Sprigs Of Dried Filler), Aussie Pine (Or Other Seasonal Evergreens), Spray Leucadendron (Separated), Red Roses, Red Mini Carnations, Green Spray Mums, Natural Pine Cones On Wooden Picks, Pheasant Feathers.